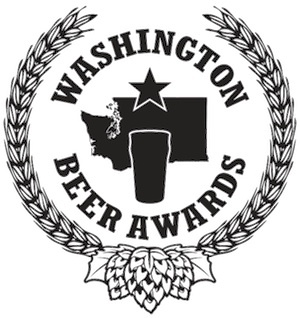 Poulsbo’s Sound Brewery and Silverdale’s Rainy Daze Brewing claimed gold at the Washington Beer Awards this month. Overall, four Kitsap-based breweries — Sound, Rainy Daze, Silver City Brewery and Bainbridge Brewing — combined for 13 medals. Kitsap breweries made an especially strong showing in Belgian- and Abbey-inspired categories, where Sound picked up three golds. 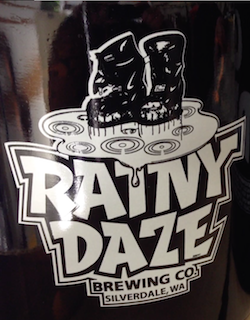 Rainy Daze won the American-style pale ale category with its Stash Box III. Hale’s Ales left the Kitsap Mall but it’s not leaving Kitsap. The Seattle-based brewery hopes to open a tasting room in West Bremerton, across the street from Hi-Lo’s 15th Street Cafe. Hale’s applied for a state liquor license Monday at 1509 Wycoff Ave.
Mike Hale said the brewery already had plans for a satellite distribution and storage warehouse in Bremerton. While setting up the warehouse, Hale and his partners decided they might as well open a “simple tasting room” on the corner. The taproom could open as early as September. “It’s a pretty fun building, a pretty fun spot,” Hale said Tuesday. Hale’s will join Hi-Lo’s at the corner of Wycoff Avenue and 15th Street. An Irish restaurant called Bualadh Bos could also open soon near the intersection. Hale said the mix of businesses should make for a busy, “beer-centric” hub. Hale’s Ales closed its Silverdale alehouse in September, after failing to draw enough customers at the mall. Mike and Kathleen Hale, who’ve lived in Kitsap County since 1986, said they wouldn’t rule out another Hale’s location on the peninsula. Now Silverdale’s loss will be Bremerton’s gain. In a county bursting with microbreweries and distilleries, a cidery was only a matter of time. Homebrewers Joel Atteberry and Melissa Kittrell have stepped up to fill that fresh niche in the local craft beverage market. 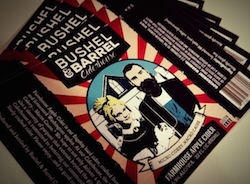 They recently founded the Bushel & Barrel Ciderhouse, a small cider making operation just north of Poulsbo. While still in its “infancy,” Bushel & Barrel’s hard cider is starting to pop up in stores and drinking establishments around the county. Kittrell said starting the cidery was a way of becoming more involved in the community. Sales of specialty ciders will benefit local charities. 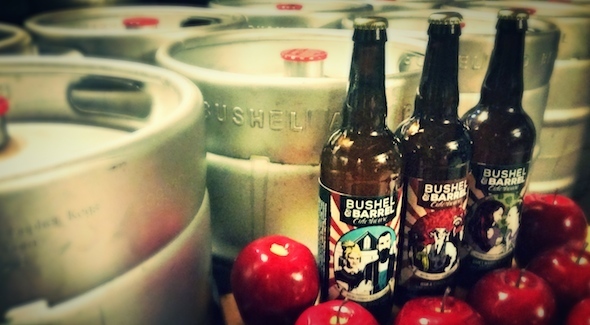 Bushel & Barrel is making cider in a traditional style. “I am striving to create a cider that is similar to and English style cider in craft, but exhibits an off dry and tart flavor from an abundance of granny smith apples,” Kittrell said. Farmhouse Apple Cider is the cidery’s flagship variety. Kittrell is also producing limited specialty batches, including a hopped cider, and an oak and ginger cider. Bushel & Barrel doesn’t have a tasting room yet, but you can find the cider on tap at Hare and Hounds Public House and Slippery Pig Brewery in Poulsbo; the Wig Wam Pub in Gorst; and Slaughter County Brewing and the Central Docks in Port in Port Orchard. Marina Market in Poulsbo carries 22 oz. bottles. Check the cidery’s page on Facebook for information and updates. Silver City Brewery, already the county’s largest beer maker, is tripling the size of its brewing system, according to a Wednesday news release. The Bremerton brewery plans to add a new 35-barrel brew house in May to replace the 10-barrel system it’s used since 1996. AAA Metal Fabrication of The Dalles, Oregon, is manufacturing the hardware. “They do quality work and we can’t wait to employ the new system and continue making great beer for our fans,” Silver City owner Scott Houmes said in the release. Silver City already installed larger fermentation tanks and bright beer tanks (tanks where beer matures after fermentation) to keep pace with increased output. The brewery produced about 8,600 barrels (267,000 gallons) last year. The new system could allow Silver City to eventually brew 20,000 barrels annually, said Kurt Larson, director of sales and marketing. While Silver City has grown, Larson said the brewery is still focused on serving the same Western Washington market. Silver City is rolling out new branding and packaging this year. Larson said the new logos are intended to give the brewery’s offering a “clean and crisp look” that’s easier for customers to find on busy supermarket shelves. Four Silver City beers — Ridgetop Red Ale, Cold One Pilsner, Ziggy Zoggy Summer Lager and a Sieben Braü, set for release next month — will be offered in 12-ounce cans. The Sieben Braü is being brewed specially for Seattle Beer Week. 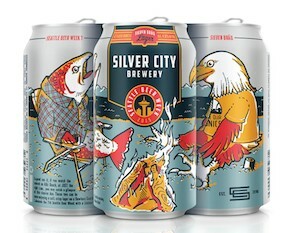 Silver City is the first brewery outside Seattle to be invited to brew the official beer for the event, which runs May 7-17. 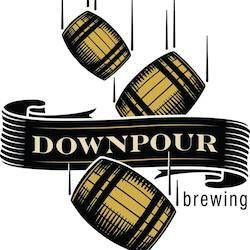 Bremerton craft beer drinkers have long craved a brewery in downtown. An Olympic College grad wants to satisfy their thirst. Jesse Wilson and wife Tasha recently launched a Kickstarter campaign for LoveCraft Brewing Company, a small-batch brewery they plan to locate in the midst of downtown. Their goal is to raise $30,000 by the end of October. As of Wednesday evening, 76 backers had already kicked in close to $9,000. The crowdsourced money won’t cover all the costs of launching a brewery, but Jesse said it will give them critical boost. “It’s enough we can go to a bank with a solid business plan and collateral,” he said. Jesse, a 2004 Olympic High graduate and 2006 OC graduate, is currently an assistant brewer at Port Townsend Brewing and has previous experience at Hale’s Ales in Seattle. He and Tasha met while working in the craft beer industry. 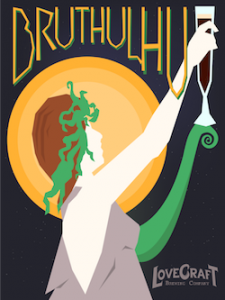 They like brewing “farmhouse” beers – traditional Belgian and French styles. But Jesse said he also has a lineup of Northwest favorites like IPAs. 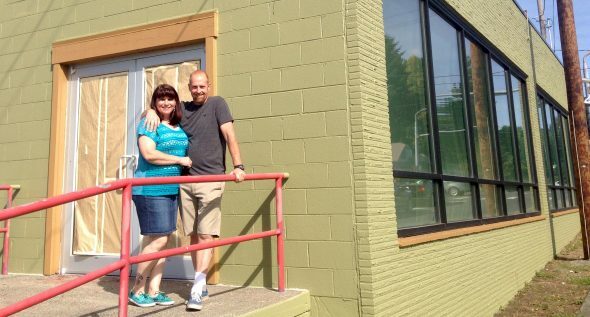 When it came to picking a location, the couple saw untapped opportunity in downtown Bremerton. They’re looking for space near Sixth Street and Pacific Avenue. LoveCraft would join Kitsap staple Silver City Brewery and Manette’s Der Blokken Brewery in the Bremerton area. An additional eight breweries are scattered across the county, with another set to open in Kingston soon. If all goes to plan, Jesse believes LoveCraft could be brewing by mid-2015. Courtesy images. Inset art by Eric JS Wahlquist. Check out my Kitsap On Tap coverage from earlier this year and the Sun’s beer page to read more about the county’s brewing scene. 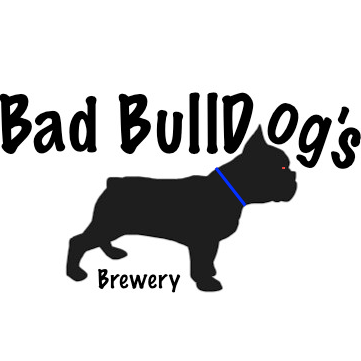 You can also find beer news and profiles of every Kitsap brewery here.